Adolf Hitler had long dreamed of making his native Austria a part of Germany and subjecting Austria’s Jews to the same fate he had in mind for the Jews of Germany. Seventy-five years ago this month, he made his move. In the very first paragraph of his autobiography, Mein Kampf, Hitler wrote that the “reunion” (Anschluss, in German) of Austria and Germany was “a task to be furthered with every means our lives long.” He argued that since the two countries were ethnically similar and had been associated in the past, it was Germany’s destiny to absorb Austria. In early 1934, about a year after he rose to power, Hitler began pressuring Austrian chancellor Engelbert Dollfuss to embrace Nazism. When Dollfuss rejected Hitler’s overtures, Austrian Nazis assassinated him. Their attempted coup failed, however, and the plotters fled to Germany. There, with Hitler’s support, they staged terrorist attacks on Austrian government institutions. These provocations increased civil turmoil in Austria and helped pave the way for German military intervention. On March 11, 1938, German troops marched into Austria to impose the Anschluss. They were greeted by huge, cheering crowds. Violent anti-Semitism erupted almost immediately in Vienna, home to most of Austria’s 190,000 Jewish citizens. The world-famous psychologist Dr. Sigmund Freud, a resident of Vienna, wrote to a friend: “The people in their worship of anti-Semitism are entirely at one with their brothers in the Reich.” Freud’s apartment was twice raided by the Nazis, and his daughter, Dr. Anna Freud, was briefly detained and interrogated by the Gestapo. Soon afterwards, the Freuds fled to England. Among the property confiscated was the Jewish-owned Hotel Metropol, which was turned into Gestapo headquarters, and the famous Rothschild and Gomperz art collections, much of which was added to the private collection of senior Nazi leader Hermann Goering. The suicide rate among Vienna Jews skyrocketed in the weeks following the Anschluss. Three generations—22 members—of a single Jewish family, the Wolkners, took their own lives in response to the Anschluss. The last of the suicides, 18 year-old Gertrude, a musician, left a note asking that a single marker be placed over the graves of all her family members. The Germans were still years away from their program of mass murder. Their goal in Austria was to make the lives of the Jews so miserable that they would emigrate. Click photo to download. 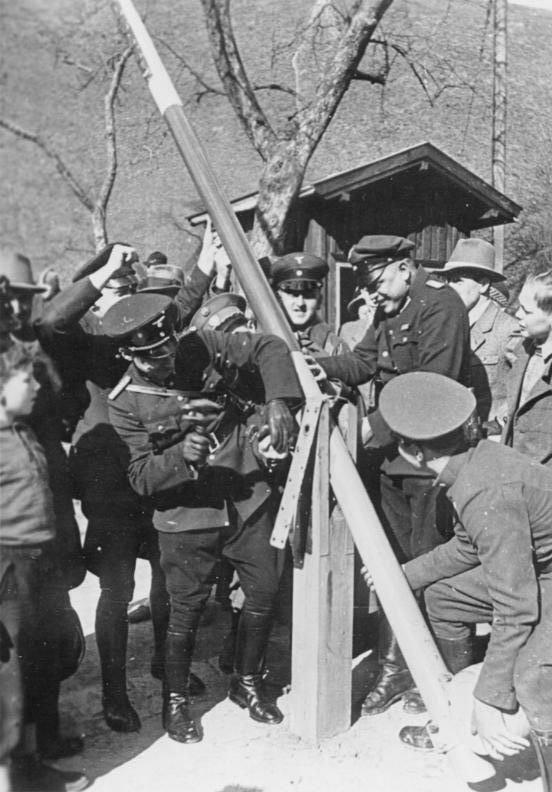 Caption: German and Austrian border police dismantle a border post on March 15, 1938. Credit: German Federal Archives. Austria’s Jews got the message. Within days of the Anschluss, the lines outside the United States consulate in Vienna stretched for blocks, as tens of thousands of Jews sought permission to immigrate to America. According to U.S. law, a maximum of 27,370 German and Austrian citizens could be admitted annually. But that allotment was almost never filled, because the Roosevelt administration implemented an array of bureaucratic obstacles that made it extremely difficult to qualify for a visa. Other countries likewise closed their doors. Ze’ev Jabotinsky’s Revisionist Zionist movement offered an alternative: Palestine. The obstacle to getting to the Holy Land was that the British Mandate authorities, in response to Palestinian Arab violence, were beginning to restrict Jewish immigration. In 1937, the Revisionist-affiliated Irgun Zvai Leumi underground sent several of its top activists to Europe to organize illegal immigration, known as Aliyah Bet. One of the organizers was 24 year-old Yitshaq Ben-Ami, the son of early Zionist pioneers (he was the first child born in Tel Aviv). Ben-Ami and his cohorts chartered small boats that brought groups of several hundred Jewish refugees from Austria and Poland to the northern coast of Palestine, where they landed late at night, near thick orange groves, to elude British patrols. The immigrants were greeted by Irgun activists, taken ashore, given false identification papers, and quickly dispersed among various towns and settlements. Because of the nature of the operation, the precise number of people brought to Palestine as part of Aliyah Bet in the late 1930s and early 1940s will never be known, but historians believe it was more than 20,000. Posted on March 11, 2013 by Rafael Medoff/JNS.org and filed under World, Features.